Digital tools help you to run your business better — but which ones do you need to prioritize? When it comes to useful online tools for the budding ecommerce entrepreneur, there are PLENTY to choose from. Below, we’ve listed the 6 top tools that you NEED for your business. EOFire (Entrepreneurs on Fire) is an award-winning podcast which focuses on the journey taken by a whole variety of successful business people. It’s an excellent source of information for entrepreneurs at any stage. In each fascinating podcast episode, each guest is asked to explain what drives them, what inspired them, and what their worst moment has been as an entrepreneur. Another one of our favorite marketing podcasts is Akimbo, run by Seth Godin, and we’ve also taken some invaluable tips from Marketing Speak over the years. Whether you’re just starting your business or have years of experience as an entrepreneur, you should always seek out as much information as possible from the pros — and these podcasts are a great source of knowledge bombs. Cybercrime is a big problem for ecommerce businesses: ecommerce transactions are now 10 times more risky than financial services. Fear not: Signifyd is here to tackle any risks ecommerce poses for your business. This fraud prevention tool helps you keep track of all your orders and flags any suspicious activity. It can be easily integrated with all major ecommerce platforms. Once your customer has placed an order, Signifyd syncs the order and then reviews it to establish if there is a fraud risk. Signifyd also lets you add device fingerprinting to your ecommerce business. Fingerprinting analyzes hundreds of browser and device data points to identify and track the devices that place transactions through your store. This reduces the chances of fraudsters being able to mask their orders. Receive pay-outs within 48 hours. Whether you need to communicate with suppliers or stakeholders, face-to-face is often the best way forward. Unfortunately, it’s not always possible to meet in person — especially if that person is based on the other side of the world. 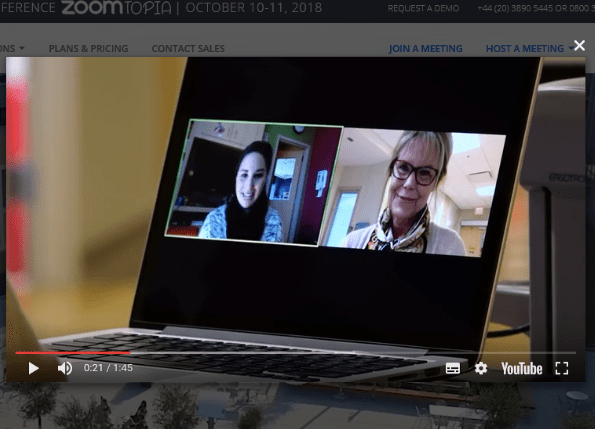 Opt for Zoom and ditch the awkward conference calls, stilted video chats and lengthy email chains. This video-conferencing tool is easy-to-use, reliable, and can incorporate up to 500 participants. Find out more and request your demo here. Data is important to your ecommerce business. It’s what you use to measure success and to isolate areas that require improvement. Google Data Studio is a useful web analytics dashboard which allows you to take raw material from your business and create reports that are insightful and easy to understand. One big perk of using Google Data Studio? You can keep all of the data from your ecommerce business’ Google accounts (Ads, Analytics, BigQuery, Sheets, etc..), along with your company Facebook page, in one place. Very handy. You can find the full list of features here. Using this free tool will help your ecommerce business to grow in the way you want it to, and remove any barriers to your growth. Check out the video below for tips on how you can get the most from Google Data Studio. With engagement levels more than 20x that of Twitter and nearly double Facebook’s engagement levels, Instagram has the most engaged users of any major social media platform. Your users are way more likely to interact with your brand on Instagram, making it a revenue stream your ecommerce business you definitely need to maximize. SocialDrift is a brilliant online marketing tool which will help you to increase your Instagram followers organically. It uses machine-learning algorithms to target your audience and connect with Instagram users, by establishing things like the best hashtags to use, or the optimum time for you to engage with your followers. Basically, SocialDrift is an easy way for you to increase your following and get your name out there. Trello is, frankly, a lifesaver. This tool makes it super easy to collaborate, get organized, and manage projects seamlessly. Think of it an online hub where team members can come together to get work done – via to-do lists, file attachments and integrated apps. RealtimeBoard is also a hot contender – so if Trello doesn’t do it for you, check out this online whiteboard platform instead. RTB is a little more expensive from the get-go, but you can use its enhance whiteboard toolkit for just about anything. So, there you have it. Our run-down of the top tools every ecommerce entrepreneur should get to grips with. Let us know if we missed anything crucial in the comments below. Patrick Foster is a writer and ecommerce expert from Ecommerce Tips — an industry-leading ecommerce blog dedicated to sharing business and entrepreneurial insights from the sector. Check out the latest news on Twitter @myecommercetips. Thank you for this impressive listing…!!! These tools are very useful to work from remote location. as per my past experiance for ecommerce website development process ,trello is really useful to collaborate with clients and concern team.Google data studio is also nice to share documents.